When you stay at International on the Water Hotel in Ascot, you'll be near the airport, within a 10-minute drive of Ascot Racecourse and Optus Stadium. This 4-star hotel is 3.5 mi (5.6 km) from Crown Perth and 7.7 mi (12.4 km) from Elizabeth Quay. Make yourself at home in one of the 100 air-conditioned rooms featuring flat-screen televisions. Complimentary wireless Internet access keeps you connected, and digital programming is available for your entertainment. Private bathrooms with showers feature complimentary toiletries and hair dryers. Conveniences include phones, as well as safes and desks. Enjoy a meal at the restaurant or snacks in the coffee shop/café. The hotel also offers room service (during limited hours). Buffet breakfasts are available daily from 6 AM to 9:30 AM for a fee. Featured amenities include dry cleaning/laundry services, a 24-hour front desk, and luggage storage. Planning an event in Ascot? This hotel has 3228 square feet (300 square meters) of space consisting of a conference center and meeting rooms. Free self parking is available onsite. The hotel offers a restaurant and a coffee shop/café. Public areas are equipped with complimentary wireless Internet access. International on the Water Hotel features an outdoor pool and a fitness center. 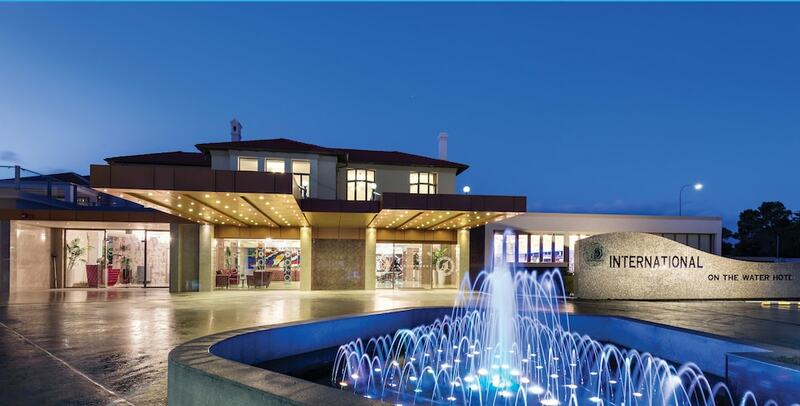 Event facilities measuring 3228 square feet (300 square meters) include a conference center. This business-friendly hotel also offers dry cleaning/laundry services, room service (during limited hours), and ATM/banking services. Limited complimentary onsite parking is available on a first-come, first-served basis. International on the Water Hotel is a smoke-free property. International on the Water Hotel has a restaurant on site.